Chanukah is now a few days in, but the boys have already gotten many things they were hoping to get. First, was a gift that they actually got a few months ago. When Disney Infinity 2.0 came out, we bought it for our boys and gave it to them as an early Chanukah present. NHL and JSL have been playing it ever since, building complex worlds and fighting many Disney and Marvel villains. Next, was Robots vs. Dinosaurs. 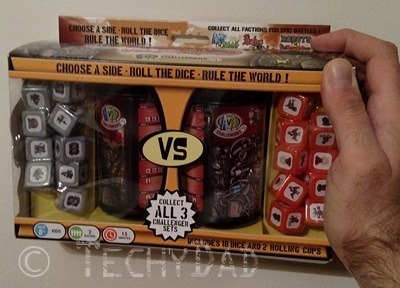 This is part of a series of dice games – they already have Pirates vs. Ninjas. Gameplay is simple, you roll your dice and those represent your troops. You then battle other player’s forces, "killing" their dice (moving them to the side) and rerolling your dice where appropriate. If all of your dice are killed, you are out. Last player standing wins. The fun part now is that we can play a four player game. Pirates versus Ninjas versus Dinosaurs versus Robots. Who will win?!!! Now if we just get Zombies vs. Wrestlers and Army vs. Aliens, we’ll have a complete set and can have a 8 way free for all! JSL’s big present was actually quite large – a full sized keyboard. 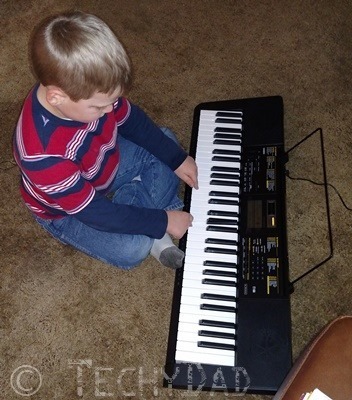 He’s been begging for one for a year now and we finally caved… And let his grandparents buy it for him. He’s now determined to learn how to play. Tonight’s present is going to be a big surprise. Don’t tell the boys, but we’re taking them to see Disney On Ice. We’ve gone to many Disney On Ice shows in the past and have enjoyed them all. This will be the first time that we’ll be surprising them with the trip on the same day. 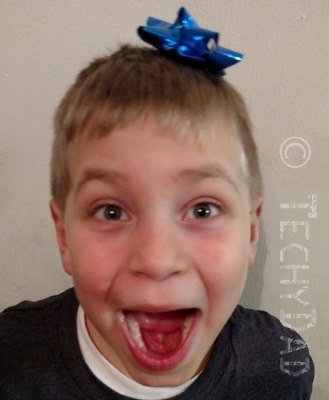 What presents have you surprised your children with?